But, Cliff, you said we weren’t going to improvise like this…. But, listen to what I say now! We’ve worked out the numbers. It’s worth the risk. – Conversation between Boeing engineer project manager Robert J. Helberg and Clifford H. Nelson, head of Langley’s Lunar Orbiter Project Office, concerning a change in the mission plan for Lunar Orbiter 1. Telescopes revealed little about the nature of the lunar surface. Not even the latest, most powerful optical instruments could see through the earth’s atmosphere well enough to resolve the moon’s detailed surface features. Even an object the size of a football stadium would not show up on a telescopic photograph, and enlarging the photograph would only increase the blur. To separate fact from fiction and obtain the necessary information about the craters, crevices, and jagged rocks on the lunar surface, NASA would have to send out automated probes to take a closer look. 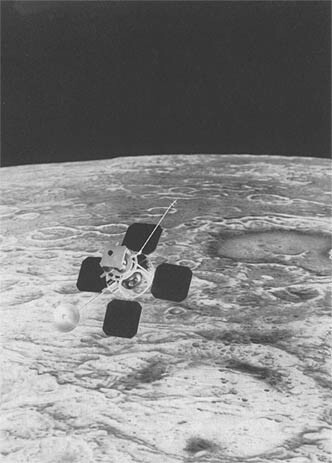 Five Lunar Orbiter missions took place. The first launch occurred in August 1966 within two months of the initial target date. The next four Lunar Orbiters were launched on schedule; the final mission was completed in August 1967, barely a year after the first launch. NASA had planned five flights because mission reliability studies had indicated that five might be necessary to achieve even one success. However, all five Lunar Orbiters were successful, and the prime objective of the project, which was to photograph in detail all the proposed landing sites, was met in three missions. This meant that the last two flights could be devoted to photographic exploration of the rest of the lunar surface for more general scientific purposes. The final cost of the program was not slight: it totaled $163 million, which was more than twice the original estimate of $77 million. That increase, however, compares favorably with the escalation in the price of similar projects, such as Surveyor, which had an estimated cost of $125 million and a final cost of $469 million. In retrospect, Lunar Orbiter must be, and rightfully has been, regarded as an unqualified success. For the people and institutions responsible, the project proved to be an overwhelmingly positive learning experience on which greater capabilities and ambitions were built. For both the prime contractor, the Boeing Company, a world leader in the building of…. The most successful of the pre-Apollo probes, Lunar Orbiter mapped the equatorial regions of the moon and gave NASA the data it needed to pinpoint ideal landing spots.